EAA AirVenture held at Oshkosh, Wisconsin is one of the premier air shows in the world and represents aircraft from small homebuilts and ultra-lights to cutting edge, technologically advanced military and space vehicles. This remarkable nine-day event drew 850,000 worldwide attendees and thousands of aircraft. This event is larger than the enormous CeBit technology show in Hanover, Germany each spring. In fact, it's larger than the major US technology shows (Comdex, CES, NAB, E3 and PC Expo/TechXNY) combined. This was the 50th anniversary of this rapidly growing event. Everything you wanted to know, learn or see about flight was represented. It was held at the Wittman Regional Airport and the surrounding area, on a virtually non-stop basis. Re-creation of the first 1953 convention -- (held at Curtiss-Wright Airport in Milwaukee, Wisconsin) Vintage displays featuring 22 airplanes, volunteers in period dress, two 1953 Fords, a 1953 John Deere tractor and early 1950's music. Countdown to Kitty Hawk -- celebrated the Wright Brothers' first flight in 1903. The City of Dayton is planning extensive celebrations around July 4, 2003 throughout their metro area which includes a new waterfront park. Air Force Museum -- a larger second hanger has been built to display and protect more of its displayed aircraft. 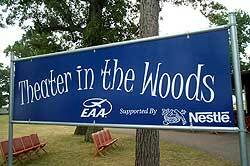 Theater In The Woods -- a 90 minute live and video special highlighting "50 Years of EAA" was presented by EAA directors Paul and Tom Poberezny. Erik Lindbergh -- the grandson of Charles Lindbergh, appeared at AeroShell Square and discussed his spring trip that retraced his grandfather's epic 1927 flight path from New York to Paris. Helios -- using video, still images and sound highlights, the August 2001 world record flight of the solar powered Helios Prototype remotely controlled aircraft was shown. NASA exhibits -- their displays at Oshkosh 2002 ranged from spacecraft to airborne earth science projects. The Hypersonic X-43A scramjet engine technology might allow aircraft to fly up to ten times the speed of sound (about 7,200 miles per hour). Earth phenomena is being studied using a one-of-a-kind DC-8 airliner, configured for scientific research, tracking and earth studies. 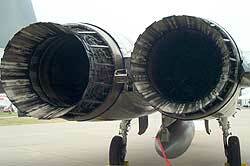 The DC-8 is based out of NASA's Dryden Flight Research Center at Edwards Air Force Base in California. 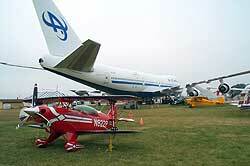 Several technology companies had a significant presence at EAA AirVenture 2002. 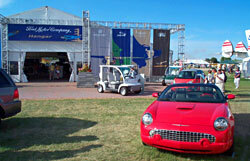 Ford Motor Company has long been involved in aviation and constructed a Hanger Pavilion at this event. NASCAR driver and pilot Rusty Wallace and Mark Martin signed autographs and answered questions. Ford plans to be active in aviation events throughout 2002 and 2003. Oracle had an aircraft performing with energetic Shaun Tucker at the controls. Microsoft showcased their popular Flight Simulator software series, including a new "Wright Brother's Flyer" Simulation and previewed Combat Flight Simulator 3, "Battle for Europe", scheduled for a fall 2002 release. Blue Sky Network displayed their wireless satellite communications solutions for aircraft pilots. They have significantly expanded their operations in spite of September 11th. 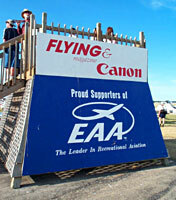 Canon, a digital technology and imaging leader was a sponsor/supporter of EAA AirVenture 2002. Some international attendees noted that "Oshkosh is like the 24 hours Of Lemans auto race, except Oshkosh runs for over a week" -- the speeds and altitudes are much greater as well. The personal attitudes of the organizers, the 5,000 volunteers and the attendees was friendly and knowledgeable. Nearly 1,000 media attended (including Reviews OnLine) from five continents. In short, it's a great event to experience and worth the long trip from California. Copyright © 2002 Jim Bennett All rights reserved.